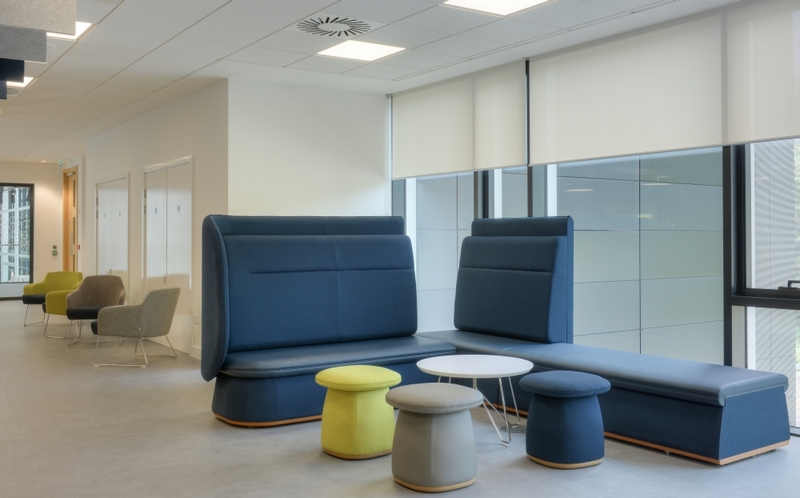 British manufacturer, Knightsbridge has supplied furniture for the University of West Scotland’s (UWS) brand new ultra-modern Lanarkshire campus. £110m was invested to create a truly innovative, dynamic and collaborative campus, hosting inspiring and flexible learning, teaching and social spaces. Designed in house with a focus on style, durability and versatility, the Knightsbridge collections are perfect for the education sector with a stunning range of meeting room, reception and breakout room furnishings. Each piece has been crafted with the user’s wellbeing in mind, helping to create spaces that foster creativity and productivity. The Lanarkshire campus embodies the UWS vision to provide 21st century, student centred, personalised, distinctive learning and teaching experiences. The design reflects the UWS belief in the transformative power of co-created learning. Every space offers an area to learn and collaborate, with a range of facilities and furniture to support and inspire the students. The Knightsbridge collections chosen by UWS for this project are Alfie, Bebop, Lucia and Slide. Bebop a range of modular seating and booths is used within informal meeting spaces on the campus creating flexibility for different functions. Bebop’s simple curves of sectional seating featuring high and low backs can be mixed and matched allowing creativity and collaboration. Bebop was designed by Knightsbridge in conjunction with international award-winning furniture designer David Fox. The angular design of the Alfie collection, designed in conjunction with Sean Dare, creates a dynamic environment, designed to foster creativity and encourage the birth of new ideas. “Knightsbridge are delighted to have been selected to provide furniture for such an innovative project, our furniture is perfect for the education sector, the new UWS campus looks fantastic and our furniture helps create the lively and vibrant atmosphere that will allow students to flourish”. “As F,F&E consultant for UWS I was responsible for finding the many different types of products that would enhance this exciting project. Having worked with Knightsbridge on numerous past projects I was delighted to put them forward as their portfolio of products are well designed, aesthetically pleasing, comfortable and with a 10-year warranty always worthy of consideration. The service from Knightsbridge was excellent and the furniture selected has been used in several different types of spaces creating a dynamic and engaging environment. I am delighted to say that the feedback from both staff & students has been very positive”.